4 ARTICLES ON VARIED TOPICS: The first is from Leo Phillipp covering his first-hand accounts of working the Earlville Turn and the Montgomery Ill., Caterpillar plant. Rupert Gamlen then fills out the rest of the issue with articles covering the La Mothe Iron Tube cars, which were early metal cars looked at and briefly used by the Q, a brief article on Thomas Potter and Henry Stone, two principal CB&Q company officers directly involved with the iron car experiment, and finally, the story of the Harvey Steel Car Company, which brought about, with the assistance of the Burlington, a revolution in the construction of freight cars. 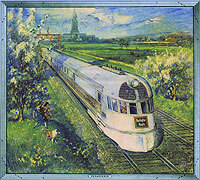 Denver Zephyr Act II - Overnight, Every Night - Burlington's 1956 Denver Zephyr: 196 pages, authored by J. W. Schultz. Picking up where Burlington Bulletin #50 left off, this issue of the Bulletin recounts the history of these last true American streamliners, 1956’s vista-dome Denver Zephyr, from their pre-service exhibitions in October 1956, through the March 1970 Burlington Northern merger, and up to their demise at the dawn of the National Railroad Passenger Corporation on May 1, 1971. This is another three topic Bulletin featuring Rupert Gamlens "Disaster in the Suburbs" article covering three early 20th century wrecks at Western Springs. Next is Leo Phillipps "Sterling Motor Car" article examining the change from steam passenger operations to a motor car on the Sterling-Shabbona-Serena (Illinois) run. Bringing up the markers is a photo essay of four months in 1959 of the Q in Lincoln from the camera of Irv Fierstein. The photos are from the BRHS Archive and were captioned by Archive Committee member Jim Sandrin. The issue is 68 pages loaded with photos, maps, charts and other illustrations. BULLETIN #53 - 3 ARTICLES ON VARIED TOPICS: First author Ronald Schmitt's "The Alton Bridge and the 'Q' connection" provides a history of the Alton (IL) Bridge and the Missouri & Illinois Bridge and Belt Line and its connections to and eventually ownership by CB&Q, Next Steve Holdings "O S BN", takes in-depth look at the entries on a June 29,1964 dispatchers' sheet from the Galesburg & Ottumwa subdivision,. Then, Rupert Gamlen's "Belmont-a Railway Town with a Tunnel", explores Nebraska's only railroad tunnel and explores the nearby towns. 76 pages including a four page Centerfold, 172 B&W and color images and 26 maps, diagrams and ephemera. Bulletin # 52 The comprehensive history of the Burlington GP30s from the EMD demonstrators, CB&Q promotion, service on the Q, GP30 locomotive pooling coverage, BN merger, the GP30E & GP30M rebuilds and ending with the Q units that are BNSF's GP39-2R locos. The issue contains 68 pages, with 79 color and 41 black and white photos, ephemera reproductions, CB&Q GP30 roster and scale drawings. 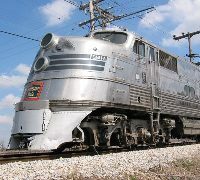 "Bulletin # 51 Author Leo Phillipp has crafted a series of articles about railroading in Aurora, IL, as experienced by the employees of the CB&Q.? Opening with a brief look at the Burlington's hometown, the Bulletin then covers the Shabonna Milk Run, a history and details of the Irish Mail, as well as interesting details about the Geneva Branch.? Also covered are articles on the Alley Job (which could provide the basis for a dandy model railroad), the Aurora Storehouse and Freight House.? A 4-page center fold-out carries a reduced Q engineering drawing of trackage from the Aurora Shops Coach Yards to the C&I / Mainline junction. The reverse side carries drawings of the Shabbona single stall enginehouse and the Standard CB&Q Motor Car Shed. At 76 pages, it contains 64 historical b&w and 48 color photos; 28 maps and 60 illustrations. Bulletin # 50 BRHS's 50th Burlington Bulletin provides a comprehensive history and operations of the 1936 Denver Zephyr, its predecessor the Advance Denver Zephyrs and brief coverage of the trainsets use on the Texas Zephyrs. The text was generously offered and compiled by John W. (Bill) Schultz from chapters in his unpublished Burlington Zephyr history. This perfect-bound issue is 148 pages in length and contains 178 historical black and white and 14 color photos, equipment roster, consists, schedules, floorplans, full-color ephemera reproductions and more. Bulletin #49 THE DRI LINE - Contains 114 pages - A comprehensive look at the Davenport, Rock Island and Northwestern Railway, a joint CB&Q and Milwaukee Road operation in what is now the Quad Cities. Coverage starts with the creation of the Davenport & Rock Island Railway Bridge Company in 1884 and goes to the merger of the line into the BN and CP in 1995. Full roster data is included along with track diagrams covering the entire line and a look at the industries served. Contains over 280 color/b&w photos and diagrams and 3 fold-outs. Bulletin #48 SPECIAL DUTY - BURLINGTON'S FLEET OF SD7s, SD9s and SD24s - Contains 104 pages - Part 2 of a comprehensive look at the QC&S's fleets of EMD SD7s, SD9s and SD24s by David Lotz and Hol Wagner. Coverage also includes modifications made by the Q and the unit's subsequent service for the BN and BNSF. Full roster data and 2 fold-out paint diagrams are featured as well. Contains over 250 color and b&w photos and diagrams. Bulletin #47 SPECIAL DUTY - BURLINGTON'S FLEET OF SD7s, SD9s and SD24s - Contains 88 pages - Part 1 of a comprehensive look at the QC&S's fleets of EMD SD7s, SD9s and SD24s by David Lotz and Hol Wagner. Also contains a short segment on Boy Scout Trains to the 1960 Jamboree outside of Colorado Springs. Contains over 170 color and b&w photos and diagrams. Bulletin #46 AURORA TRACK ELEVATION - Contains 63 pages - Elevation of the Burlington mainline trackage through Aurora, Illinois by Jerry Hamsmith with input and assistance from Steven Holding. Also includes a look at the opening of the Cicero Automatic Classification Yard. Bulletin #45 MODERN AMERICANS - Contains 95 pages - A comprehensive look at the Burlington's A-2 and A-6 class 4-4-0 locomotives by Hol Wagner. Also includes a look at the Burlington's exhibition engines. Contains over 200 color and b&w photos diagrams and a complete class A-2 and A-6 roster. Bulletin #44 B&MRR LOCOS - Contains 112 pages - Locomotives of the Burlington and Missouri River Railroad in Nebraska including assignments and tonnage ratings, complete all-time roster with renumberings and dispositions, data on B&MR shops and roundhouses, 128 photos, locomotive diagrams, roundhouse plans. Bulletin #43 9900 PIONEER ZEPHYR - Contains 48 pages - Includes a reprint of the 1934 Traffic World article. 60+ photos and illustrations. Bulletin #42 EXPOSITION FLYER - Contains 263 pages - Detailed history of the train by J.W. Schultz and Hol Wagner. Color and b&w photos and drawings. Bulletin #41 Q 537 - Contains 92 pages - First 73 pages on CB&Q #537, the Burlington's best known narrow gauge 2-8-0, with information on the other Black Hills narrow gauge locomotives. Also, 14 pages on Ira Eigsti's Buda, Illinois, with 20 late 1940's, early 1950's photos in and around Buda, located on the Chicago-Galesburg mainline. Bulletin #40 THE COLE CREEK DISASTER - Contains 44 pages - all black and white, contains two articles, both related to the severe flooding that hit the Q's Casper Division mainline in Wyoming during summer and fall 1923. The first article covers the rebuilding and relocation of 20 miles of mainline between Bonneville and Lysite, while the second deals with the disastrous wreck of Denver-bound passenger train No. 30 which crashed through a flood-weakened bridge just east of Casper on Sept. 27, 1923. 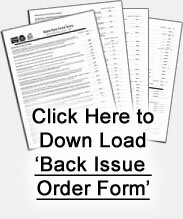 Bulletin #39 TRACK INSPECTION - Contains 84 pages - Covers track inspection vehicles: steam inspection locomotives, automotive inspection cars, and rail detector cars. With 155 photos, 43 in color, plans and extensive data on this progression of 20th Century vehicles. Bulletin #38 SNOWPLOWS - Contains 120 pages - History, photos and plans of Burlington (including C&S and FW&D) snowfighting equipment, including rotary and Jull plows, wedge pilot and push plows, flangers, spreaders, and the like. Extensive coverage of the Blizzard of 1949 and the plow re-building that followed. A dozen views in full color. Bulletin #37 BURLINGTON BOXES (CB&Q two and three story depotdivision office buildings of the 20th century) - Contains 96 pages - CB&Q depotdivision office buildings, covering the structures at Aurora, Galesburg, Davenport, North LaCrosse, Lincoln, McCook, Alliance, Sheridan, and Casper. Includes 140 photos, plus diagrams of each structure. Bulletin #36 HAVELOCK BAGGAGE CARS, B. CORBIN REMEMBERED, WESTERN SPRINGS DEPOT - Contains 80 pages - History, photos and plans of the Havelock economy baggage cars, Bernard Corbin biography and photos, and photos and drawings of the Western Springs (Illinois) depot and elevated crossing gate tower. Bulletin #35 THE Q IN THE COAL FIELDS OF SOUTHERN ILLINOIS - One of our largest issues ever, contains 256 pages of information and photographs compiled by BRHS member John Mitchell. The issue is solely devoted to the portion of the Beardstown Division south of Centralia that served over 70 coal mines. It includes information on operations, motive power, rolling stock, structures, MOW equipment, people, mines served and a small section on the Paducah & Illinois and the Q's navy! Bulletin #34 BURLINGTON'S MALLETS - Focused around the South Dakota area in conjunction with our 1998 Annual Meet in Deadwood. It includes 50 pages on the CB&Q Mallets locomotives, the T1, T2 and T3s; 20 pages on the Cambria Branch line by Mel McFarland; and a 20-page article on the Spearfish Combine. Bulletin #33 THE S-4 HUDSONS - Contains 164 pages covering the entire roster of the 3000 and 4000 series S-4 and S-4A class locomotives with history, photos, roster, operations and details. Bulletin #32 SUGAR BEETS - Currently out of print, contains 76 pages of comprehensive history and photos of one of the largest seasonal traffic sources on Lines West and on the C &S. Includes 60 full color photographs! Bulletin #31 BRIDGEPORT, NEBRASKA - Contains 48 pages of history and photos of a Q junction point and roundhouse location, and the story of John Fischer, a locomotive painter hired in 1926, who worked in the Lincoln roundhouse until 1974. Bulletin #30 IOWA NARROW GAUGE - Contains 80 pages of comprehensive history and photos of the Iowa narrow gauge branch lines that ran from Burlington to Washington and Winfield to Oskaloosa, with a special section of Charles Franzen's photographs in Washington. Bulletin #29 Q CONSOLS - Contains 68 pages of history, roster, photos, diagrams of the Consolidation type steam locomotives. Bulletin #28 BILLBOARD REEFERS - Contains 64 pages of history, photos, paint and lettering diagrams of ice reefers sub-leased to and painted for shippers on the Burlington in the 1933-1934 era. Bulletin #27 THE O'NEIL BRANCH - Contains 68 pages of history and photos of the Nebraska branch line built as the Pacific Short Line. Also history, photos, drawings of railroad scales and the cars used to calibrate those scales. Bulletin #26 BURLINGTON SHOPS - Contains 96 pages of comprehensive history and photos of the main back shops of the CB&Q. Bulletin #25 STOCK CARS AND LIVESTOCK TRAFFIC - Contains 136 pages of history, photos, drawings, roster of all Burlington stock cars and associated facilities, including drovers cars and passenger service horse cars. Bulletin #24, BURLINGTON BUSES - Contains 80 pages of history and photos of the various bus lines affiliated with the Burlington. Also history and photos of the dynamometer test cars. Bulletin #23 BURLINGTON, IOWA - Heart of the CB&Q, is available as a reprint. It contains 124 information packed pages of the history of the Burlington Railroad as it relates its namesake city, Burlington. Over 240 photos, along with trackage diagrams and drawings complete this comprehensive history. A MUST for any Burlington library! Bulletin #22 TRAINS OF THE GODS AND GODDESSES - Available as a reprint, contains 56 pages of history, photos, rosters and diagrams of the seven car articulated trainsets first used as the Second Twin Cities Zephyr, and later as the Nebraska Zephyr. Also includes ""OS Creston,"" a look at trains and dispatching in and out of Creston, Iowa on April 5, 1949. Bulletin #20 COVERED HOPPERS - Contains 64 pages of history, photos, roster, paint and lettering styles of all Q hopper classes. Bulletin #15 THE SSS CHAIR CARS Burlington Bulletin No. 15 was published in January 1986. This 38-page issue contains an excellent article written by CB&Q authority J.W. "Bill" Schultz on the CB&Q's SSS Chair Cars. The main article is 20 pages containing photos, diagrams and scale drawings. A second article written by F. Hol Wagner on the Burlington's Bomber box is 13 pages long and also has photos diagrams and a 3-page foldout. Bulletin #13 SHOVELNOSES - Available as a reprint, contains 48 pages of history, photos, roster, diagrams, of the early custom built, stainless steel articulated Zephyr trains and non-articulated Zephyr locomotives, numbers 9900 through 9908. Bulletin #12 REEFERS - Available as a reprint, contains 52 pages of history, photos, roster, paint and lettering styles of the wood and steel ice refrigerator cars of the BREX and MNX. Includes mechanical reefers and insulated boxcars. Bulletin #11 CRESTON, IOWA - Available as a reprint, contains 40 pages of a comprehensive history and photos of the Central Iowa division point. Bulletin #10 E-UNITS - Available as a reprint, contains 44 pages of history, photos, roster, paint and lettering styles of the EMD E-units. Out Of Print Burlington Bulletin Nos. 5, 6, 8, & 9 Available On This Single CD-ROM. Bulletin #09 SENECA, NEBRASKA Currently out of print, but this issue is available on CD. For more information, see product number CD-ROM 5-6-8-9 above. Bulletin #08 RAILWAY MAIL SERVICE ON THE BURLINGTON Currently out of print, but this issue is available on CD. For more information, see product number CD-ROM 5-6-8-9 above. Bulletin #07 CLASS XM-32 STEEL BOXCARS - Available as a reprint, contains 28 pages of history, photos, roster, paint and lettering styles of the 1937 AAR design boxcar. Bulletin #06 CENTER CABS Currently out of print, but this issue is available on CD. For more information, see product number CD-ROM 5-6-8-9 above. Bulletin #05 THE DENVER SHOPS Currently out of print, but this issue is available on CD. For more information, see product number CD-ROM 5-6-8-9 above. Bulletin #04 GRAYBACKS AND 6100'S - Available as a reprint, contains 36 pages of history, photos, roster, diagrams, paint and lettering styles of the F-units photos and roster plus photos and diagrams of the 6100 series heavyweight coaches. Bulletin #03 CLASS T-2 2-6-6-2'S - Contains history, photos, diagrams of the class T-2 2-6-6-2 mallets, with a section on gas electric operations and costs (from Railway Age 22831). Currently available in the Special Edition soft cover. See Product Code BBse1 below. Bulletin #02 THOSE ALCO-GE SWITCHERS - Contains history, photos and diagrams of the Alco-GE S-2 diesel switchers. Currently available in the Special Edition soft cover. See Product Code BBse1 below. Bulletin #01 DINKIES IN TRANSITION - Contains photos, schedules, advertisements of the transition from steam to diesel on Chicago suburban operations. Currently available in the Special Edition soft cover. See Product Code BBse1 below.